Need to Attend a Substance Abuse Facility, Mothers Insurance Wont Cover It Could I Get My Own? Question by Steve S: Need to Attend a Substance Abuse Facility, Mothers Insurance wont cover it could I get my own? I need to go into a substance abuse facility to get off a prescribed medication Ive been on for a while. The facility I want to go to is in Florida, however I live in Michigan. I am a dependent on my mothers Blue Cross PPO insurance policy however they will not accept places like this. I am a full time student, 22 years old. I know that Aetna insurance covers this place so I was thinking of applying with them. Should I tell them before hand that I want to attend this place so I can pick the best plan, or will that probably ensure they wont cover me? Its like $ 20k to go. Please only answer if you are familiar with insurance. Look, if you tell them you’re addicted to your prescription medication, they’re going to turn you down. And if you don’t tell them, they’re going to deny the claim and cancel your policy for material misrepresentation. That’s assuming that whatever condition you have, that requires the prescriptions, doesn’t flat out disqualify you from coverage. It’s not going to work. If you can’t pay cash, you’ll have to go to the ‘in network’ place for the coverage you already have. Sorry. Krantz, medical director of the Hanley Center, a drug treatment center in West Palm Beach, Fla., explained to "Early Show on Saturday Morning" co-anchor Rebecca Jarvisthat, "It definitely is a pandemic in the United States today, and we got there, essentially, in the late 1990s, there was a paradigm shift for treating chronic pain. And at the same time there was direct consumer advertising. So, it made the perfect storm. People now were going to their physicians, and they have arthritis, the weekend warriors, the baby boomers, and they’re saying, ‘I have this pain,’ and doctors are over-prescribing. (CBS) A new drug problem is emerging in the United States: an alarming national epidemic of pill popping and prescription drug abuse so bad it’s being called "Pharmageddon." 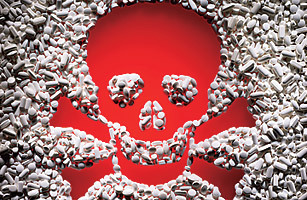 The latest issue of Time magazine has numbers painting a disturbing picture: Over the last two decades, deaths from accidental drug overdoses have increased five-fold. And, for the first time, unintentional overdoses have replaced car accidents as the leading cause of accidental death in 15 states and the District of Columbia. It’s a problem Dr. Barbra Krantz describes as "the perfect storm." Krantz, medical director of the Hanley Center, a drug treatment center in West Palm Beach, Fla., explained to "Early Show on Saturday Morning" co-anchor Rebecca Jarvisthat, "It definitely is a pandemic in the United States today, and we got there, essentially, in the late 1990s, there was a paradigm shift for treating chronic pain. And at the same time there was direct consumer advertising. So, it made the perfect storm. People now were going to their physicians, and they have arthritis, the weekend warriors, the baby boomers, and they’re saying, ‘I have this pain,’ and doctors are over-prescribing. "The most at risk are not the street junkies, the typical stereotype that you would think of, but the people that are working, that are educated, that have had professions that are now looking for that better living through better chemistry." Ron Dash, a former Hanley patient and a recovering prescription drug addict, told Jarvis, "For me, it started at a very young age, at the age of 10. I had some anxiety problems and I was given a prescription for Phenobarbital. I believe that set me off in the direction of not dealing with things that bothered me and going to doctors and asking for a quick fix, something to help me feel better. Over the course of my youth, growing up in the ’60s, the culture was encouraging towards social drug use. As I got into my professional career, as a professional businessman, I went to doctors and I got prescriptions for stress, and it just mushroomed and progressed from there. At the age of — my first surgery, I was given a prescription medication for pain, Vicodin. And as I grew older, I just became slowly more and more dependent on taking medications to help me cope, get up for work and get through my day." Activities abandoned or reduced: "There’s a progressive isolation that occurs in their life. Where they get to is that the drug is the only thing that’s important to them, obtaining the drug." Dependence on the drug: "Dependence, tolerance, withdrawal is another sign," Krantz said. Duration or amount greater than intended, intra-personal consequences — that they can’t cut down or control it. And when it becomes time-consuming: "What happens," Krantz said, "is that the person finds themselves needing to take more of the prescription drug than intended or prescribed, and then they’re taking friends, or they’re asking friends for their drugs. We saw a serious increase in the baby boomer drug addict. About 70 percent of our patients at Hanley are baby boomers. We have special program for them now." It’s not easy to find a mother who would look back fondly on the time her son had cancer. But Penny (not her real name) does. Penny lives in Boston, and her son got sick when he was just 13. He struggled with the disease for several years — through the battery of tests and the horror of the diagnosis and, worst of all, through the pain that came from the treatment. For that last one, at least, there was help — Oxycontin, a time-released opioid that works for up to 12 hours. It did the job, and more. The brain loves Oxycontin — the way the drug lights up the limbic system, with cascading effects through the ventral striatum, midbrain, amygdala, orbitofrontal cortex and prefrontal cortex, leaving pure pleasure in its wake. What the brain loves, it learns to crave. That’s especially so when the alternative is the cruel pain of cancer therapy. By the time Penny’s son was 17, his cancer was licked — but his taste for Oxy wasn’t. When his doctor quit prescribing him the stuff, the boy found the next best — or next available — thing: heroin. Penny soon began spending her Monday nights at meetings of the support group Learn to Cope, a Boston-based organization that counsels families of addicts, particularly those hooked on opioids or heroin. "Penny told the group that she actually misses her son’s cancer," says Joanne Peterson, the founder of Learn to Cope. "When he had that, everyone was around. When he had that, he had support." Penny and her son are not unique. Humans have never lacked for ways to get wasted. The natural world is full of intoxicating leaves and fruits and fungi, and for centuries, science has added to the pharmacopoeia. In the past two decades, that’s been especially true. As the medical community has become more attentive to acute and chronic pain, a bounty of new drugs has rolled off Big Pharma’s production line. There was fentanyl, a synthetic opioid around since the 1960s that went into wide use as a treatment for cancer pain in the 1990s. That was followed by Oxycodone, a short-acting drug for more routine pain, and after that came Oxycontin, a 12-hour formulation of the same powerful pill. Finally came hydrocodone, sold under numerous brand names, including Vicodin. Essentially the same opioid mixed with acetaminophen, hydrocodone seemed like health food compared with its chemical cousins, and it has been regulated accordingly. The government considers hydrocodone a Schedule III drug — one with a "moderate or low" risk of dependency, as opposed to Schedule II’s, which carry a "severe" risk. Physicians must submit a written prescription for Schedule II drugs; for Schedule III’s, they just phone the pharmacy. (Schedule I substances are drugs like heroin that are never prescribed.) For patients, that wealth of choices spelled danger. "If someone is dying, addiction isn’t a problem," says Dr. Jim Rathmell, chief of the division of pain medicine at Massachusetts General Hospital. "But for prescribers, the distinction between a patient who has three or four weeks to live and one who’s 32 and has chronic back pain started to blur." The result has hardly been a surprise. Since 1990, there has been a tenfold increase in prescriptions for opioids in the U.S., according to the Centers for Disease Control and Prevention (CDC). In 2007, 3.7 million people filled 21 million legal prescriptions for opioid painkillers, and 5.2 million people over the age of 12 reported using prescription painkillers nonmedically in the previous month, according to a survey by the Substance Abuse and Mental Health Services Administration (SAMHSA). From 2004 to ’08, emergency-room visits for opioid misuse doubled. At the same time, the drugs have become the stuff of pop culture, gaining cachet in the process. The fictitious Dr. House and Nurse Jackie gobble them like gumdrops, as did the decidedly nonfictional Rush Limbaugh and Heath Ledger. And, like Ledger, some users don’t make it out alive. In 1990 there were barely 6,000 deaths from accidental drug poisoning in the U.S. By 2007 that number had nearly quintupled, to 27,658. In 15 states and the District of Columbia, unintentional overdoses have, for the first time in modern memory, replaced motor-vehicle incidents as the leading cause of accidental death; and in three more states it’s close to a tie. Watch TIME’s video "Forget to Take Your Pills? Don’t Worry, They’ll Call You." Detox is one of the core parts of the curing program at the detox centers. It entails the physical reliance on the substance. Detox programs use several methods to prevail over the physical craving and condition the system for counseling and mental rehab. It is the first part of any treatment program and is necessary for the optimum usefulness of other components such as guidance and care after treatment. There are many ways in which these facilities can help you with the cleansing program. Is There a Way to Get Out of Going to a Detox Center? The method of dealing with substance abuse craving is not an effortless process. You may need to deal with many dilemmas to accomplish your objective. Most rehab centers gives you aid to cleanse your body and remove all the impurities. This process is referred to as detox, and the facilities which provide this program are called detox centers. Without these facilities, the entire process of treatment becomes moot. When an individual is at such a centre, toxins present in the body are removed through several ways. If they are not purged entirely, it may create cravings and the patient tends to go back to the addiction stage. All the treatment courses at the centers for detox are separated into three different types – natural, medical and rapid detox. The natural detox process employs natural solutions to eliminate harmful toxins from your body. Only all-natural and homeopathic treatments are utilized in this variety of procedure. Typical natural remedies used are Foeniculum vulgare or fennel, and Taraxacum officinalis or dandelion. They are thought of as the most trustworthy way to clear your body. Along with the herbal remedies, a sensible food plan including fresh vegetables, fruits, soups and fruit juices are also included. When combined with working out and a lot of water, they are confirmed to be quite effective in advoiding withdrawal manifestations. Another technique used by detox centers is medical detox. It is usually written up for users who have various other health-related and mental health difficulties. Natural detox may not be enough in such cases. Close overseeing is needed, and the user may need prescription medications like Klonepin to cut back the withdrawal symptoms. Clients are analyzed consistently checked regularly, and further psychological encouragement is given. This sort of rehabilitation will usually last for three to seven days. Rapid detox is another option used to eliminate unhealthy toxins from the body. The individual is given common anesthesia and medicines are employed to complete the process rapidly. It can persist from four to six hours and is considered as a quick recovery technique. But, the patient requires counseling and other aid programs to finish the process of rehabilitation. Visibly, the detox centers will allow you to select the best strategy for detox and recover confidently. Drug and alcohol rehab and detox facilities in Florida provide acute physical, mental, and spiritual crisis stabilization. An experienced addiction clinician puts it thusly, “If it’s not choking you, it can wait.” That is, treatment at this point is centered on the laying of groundwork for a lifetime in recovery rather than attempting to fix everything that contributed to, and was caused by, chemical dependency. Those seeking assistance at Alcohol rehab florida are indeed choking. And in the throes of a life-threatening crisis — physically, mentally, and spiritually. Detoxification is often necessary to ensure a client’s safe withdrawal from drug and/or alcohol. Prescription medications are available to ease the cravings and physical pain of withdrawal. The entire process should be supervised by a physician. Once detoxification has been completed, the treatment program can begin. But the physical process of recovery doesn’t end with the completion of detox. Clients in treatment are taught, occasionally with some difficulty, the value of being in good physical shape. The behaviors of active alcoholics and addicts make identifying and treating mental illnesses difficult. However in the absence of alcohol or other drug of choice, a proper diagnosis can be obtained and appropriate treatment initiated. Both Alcoholics Anonymous and Narcotics Anonymous consider themselves to be “spiritual” rather than “religious” programs of recovery. No belief in any religion is required whatsoever, although firm religious conviction of any sort will certainly not prove to be an impediment to recovery. Alcoholism and drug addiction are diseases of the body, mind, and spirit. Drug and alcohol rehab facilities in Florida can help. Narcotics Anonymous. Van Nuys, CA: World Service Office, 1993.